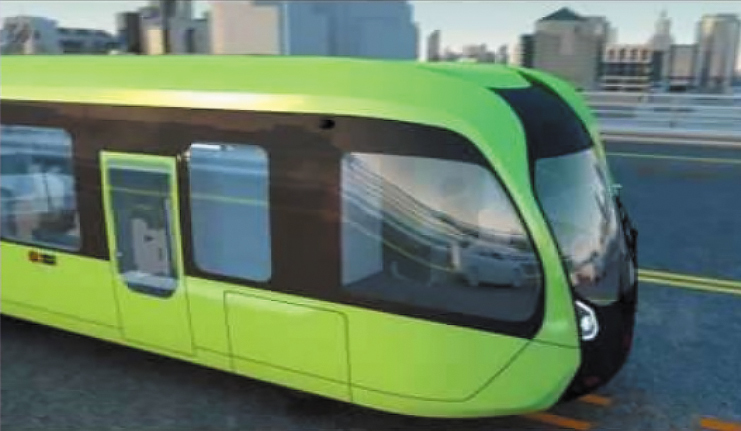 A new trackless train that floats above movable rubberized strips may be one alternative to solving Miami-Dade’s transit problems, said Frank Guyamier, Miami-Dade County deputy engineering director. “We want to show you next-generation technology, just to show you where we started and what’s in the future,” he told members of the Transportation Planning Organization (TPO)’s Transportation & Mobility Committee on Aug. 16. Among its other attributes, the train can be arranged in almost limitless configurations of cars and shells, can have a driver or not, and has a tighter turning circle than a conventional bus or a train. It is guided by sensors that read coding within the rubber strips, Mr. Guyamier said. “What’s the feasibility of these cars being available anytime soon in this county?” asked committee member Daniella Levine Cava, who is a county commissioner. “It’s too early to tell,” Mr. Guy said. “We’d have to contact them.” The trains are not being manufactured in the US now, he said. “I would say, at some point, we’re going to start some sort of a public process to invite people to bid,” said Francis Suarez, committee chair and Miami commissioner. “My thinking has always been that we find a source of money, have a variety of modalities, and let the world compete for our business. We get the best tech and the best price, marry those things together and make a decision. “We’re competing against the rest of the US,” Mr. Suarez agreed. A variety of funding schemes is being considered for all of the corridors slated for transit improvements, said Aileen Bouclé, TPO executive director. Public-private partnerships are part of the mix, along with state and federal funding, she added. This “revolutionary” trackless train everyone down at city hall is jumping up and down about is… a bus. It rides on rubber tires between rubber markers on… streets. That means it’s competing for space with… cars. There is no cheap way of solving our local mass trans problems. However, the framework of the only real solution for our commuting woes already exists. It’s called MetroRail and MetroMover. It’s elevated over the traffic grid and works. It just needs to be extended to other parts of the county. So they want to change the facade of a bus and disguise it to look like a train. Why do I feel this is like the episode of the Simpsons when they wanted implement the monorail in the city lol Instead of investing in quick schemes, why dont they invest in something that will due us service. The current POTUS was elected on the mantra: “Made in America”. So Miami is going to “Buy Chinese”?! Since the County “sold out” on the sanctuary cities issue, it doesn’t look good for attracting federal dollars. Also, if Miami’s recent floods illustrate, the expressways may become useless. The elevated Metrorail looks like a better bet…especially in light of what Houston is going through now. The technology being proposed, unlike the one in Europe, has not been tested and can mostly be considered vaporware to manipulate public opinion. It will never happen. Moreover, in Europe, this type of automated system has been mostly unsuccessful, clearly unfit for larger urban areas like Miami, and a poor excuse for the lack of real urban rail. We need a fully grade separated system that is hurricane proof. Metromover and Metrorail are good examples, but Metromover is very slow, and Metrorail runs on very long intervals that often make it unpractical. A system like the skytrain in Vancouver, the VAL in Toulouse, or the Tokyo/Osaka monorails would be a better fit. Part of the problem is the additional stop lights necessary at crossings. Think how it was with the FEC railroad running along US-1 to Homestead. The Busway creates the same time of additional traffic lights at each crossing. The best solution would be an elevated rail, that elevated train/trackless train is one of the few ways to reduce traffic congestion and provide fast transport from Homestead to Dadeland where the elevated rail can feed to the rest of Miami. Every “improvement” at ground level just creates more congestion, rather than helping the traffic situation. Guys why are you still trying to solve the impossible? Most American cities were built for the automobile not for mass transit. The only solution is to stop urban sprawl, end free parking and dedicated lanes for mass transit. since it seems, our elected officials don’t know how to make money under the table with mass transit, they keep doing everything they can to distract us: claiming we don’t need rail because of uber, or riderless cars, calling express buses something else with some illogical plan for “dedicated lanes” on streets where they’ll get blocked by cross traffic anyway … and now this jetsons seeming but not really concept which wouldn’t solve things anyway. Decades go by but nothing changes but the traffic. … if they aren’t concerned only with self-interest, why wouldn’t they be focusing on the only real solution now, which takes years – expand metro rail. Absolutely a bus in disguise. As long as it is at grade, it no faster/better than a bus. This is a bad idea for such a large city. Agree. The ONLY WAY to solve the traffic problem is to place fast transit ABOVE GROUND LEVEL. To do less is not a solution! Previously due to power outages I sent via 3rd party, a pdf letter with reference attachments included, to Mr. Lewis (publisher) regarding the “Trackless train…”article by Catherine Lackner. According to sources listed on Wikipedia (also ref. by Jaime) this latest iteration of BRT – bus rapid transit has assumed several names where it has operated: BRT, guided (rubber tired) transit, etc., claimed to be cheaper than rail – based transit. favorable financing and multi – year maintenance, what pubic Florida official would say no? But it was all done before. And it was costly. All the above took place with transit authorities in France (cities of Caen, Nancy, Paris demonstrator) and Belgium. Between 2000 -2016 270 million Euros were spent on the Caen BRT-Guided bus. Caen municipality will replace it with rail transit during 2018. FROM WIKIPEDIA: The vehicles have shown a tendency to move erratically when running free, and do not respond well should the driver mistakenly attempt to steer while following the guidance rail (for example, to avoid a pedestrian or animal running into the street). In addition, due to the tyres running over the same spot in the road, in both Nancy and Caen there has been significant rutting of the roadway, resulting in extensive repairs at significant cost to the operator. This could be considered to add to the already high running costs. Ride quality is also said to be poor, not much of an improvement on a bus, due to the four-wheeled design, whereas trams have bogies. Guidewheel mechanical failures have occurred, causing the trolleybus to swerve off the roadway. This is due to the high centrifugal forces exerted on the wheel when rounding corners. Due to this, a speed limit of 10 km/h is now enforced on corners. One of the main aims of the system, to achieve a lower cost per kilometre than trams, has failed. Other French tramways achieve a cost per kilometre at least 10% lower than that for the guided bus. Similarly, the cost per person[clarification needed] of the vehicles is also noticeably higher with the guided bus than a tram.